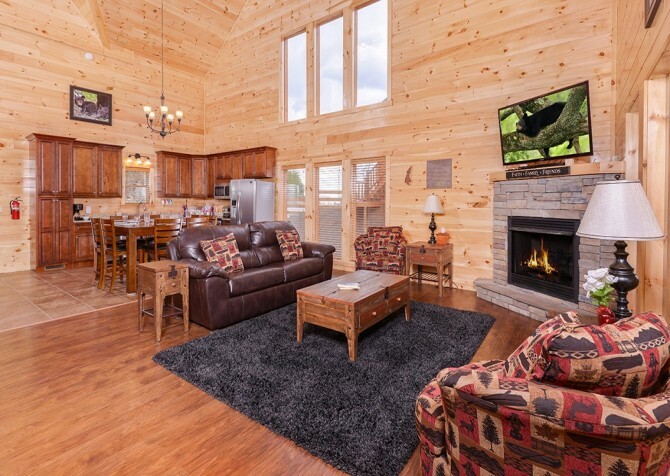 For couples’ retreats, small group getaways, and family vacations, be sure to check out Beaver’s Treehouse, a cabin in the Sherwood Forest community located just 5 miles from downtown Pigeon Forge. 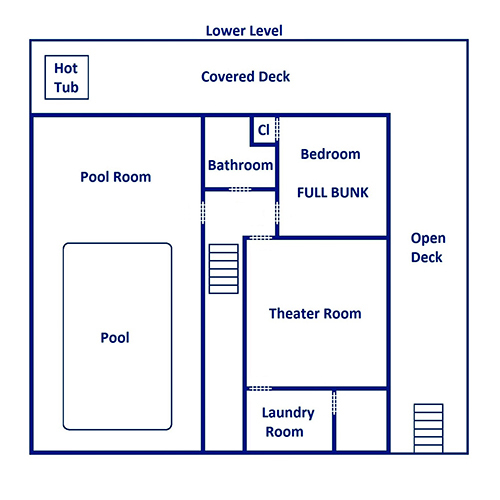 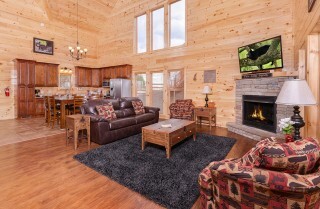 Because this cabin is located in Sherwood Forest, you’ll have access to an outdoor community pool and hot tub throughout the year. 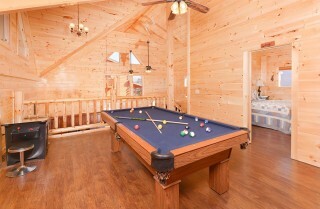 But that’s not all this Pigeon Forge cabin has to offer. 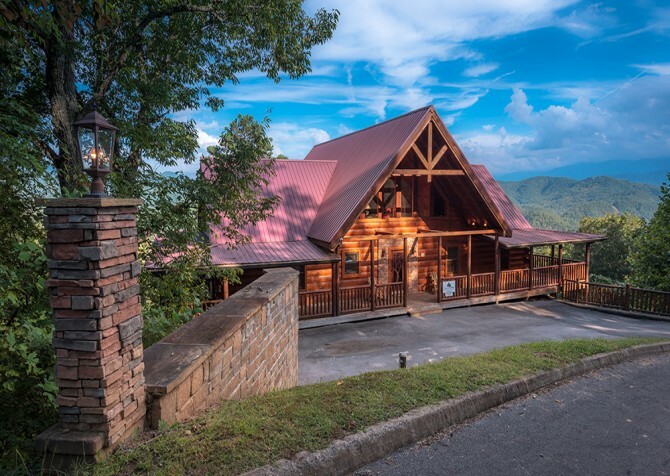 Inside this cabin, you’ll have access to your very own private indoor pool, and on the deck, you’ll have your very own hot tub with gorgeous Smoky Mountain views. Enjoy all this as well as a big screen TV, private theater room, and other entertaining features inside Beaver’s Treehouse – everything you need to keep a group entertained and relaxed! 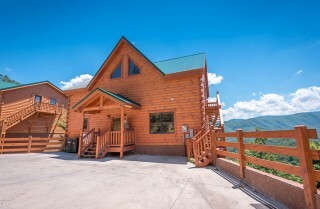 This cabin offers 4 bedrooms and 4 bathrooms, providing comfortable sleeping accommodations for up to 14 guests. Bring your crew and enjoy the best of Smoky Mountain living together at Beaver’s Treehouse. The high ceilings, large windows, and open floor plan of Beaver’s Treehouse make the living room an inviting space for your small group to gather. Enjoy a relaxing evening on the brown leather couch and two plush chairs in this space. Start a comforting fire with your gas fireplace in the corner of the living room and curl up to watch a favorite movie or TV show on the big screen TV mounted above it. 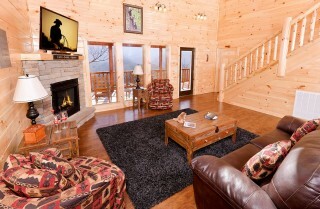 The Beaver’s Treehouse living room is a great place for group meetings, couples’ game nights, or a family gift swap. If you’re planning on visiting Pigeon Forge for the holidays, simply set out your favorite holiday munchies on the coffee table and enjoy each other’s company around the fire. 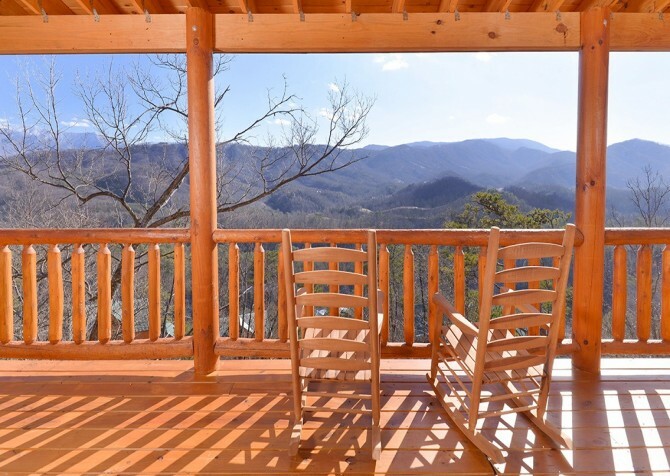 You should also plan to check out special holiday events for your group at nearby attractions like Dollywood. 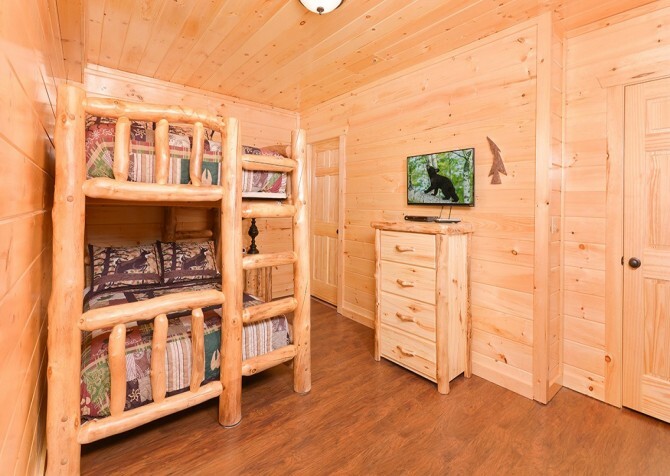 The living room at Beaver’s Treehouse also contains side tables and reading lamps, providing quiet places to read or sip coffee in the mornings. 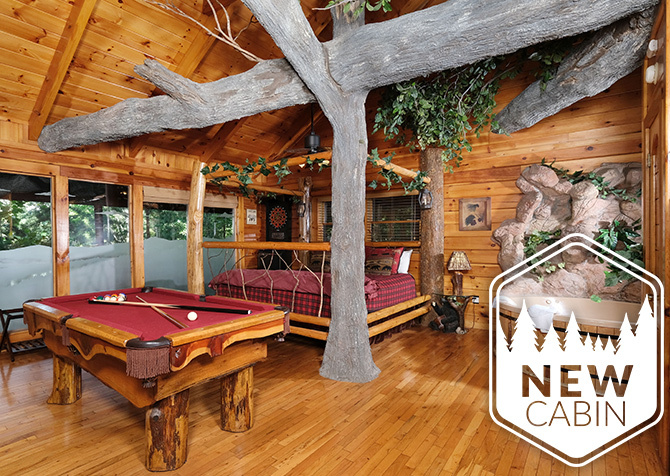 The kitchen inside Beaver’s Treehouse continues the open-concept design of this cabin’s floor plan. 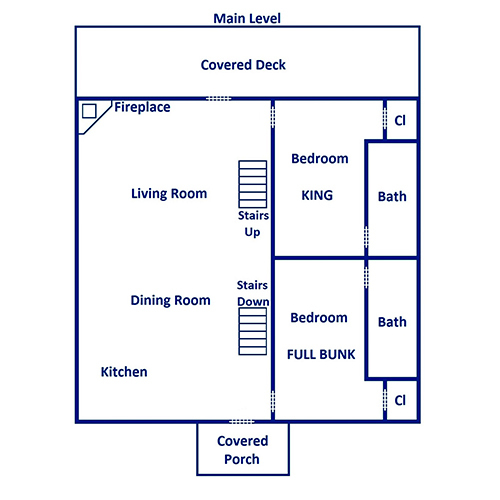 With tile floors, dark-wash cabinets, and granite countertops, this kitchen also features a modern design with optimal functionality. 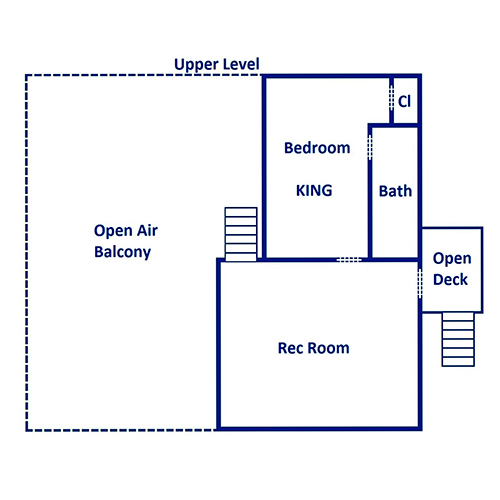 Enjoy black-and-stainless-steel appliances in this space, including a full-size refrigerator, over-the-range microwave, electric stove, oven, and dishwasher. 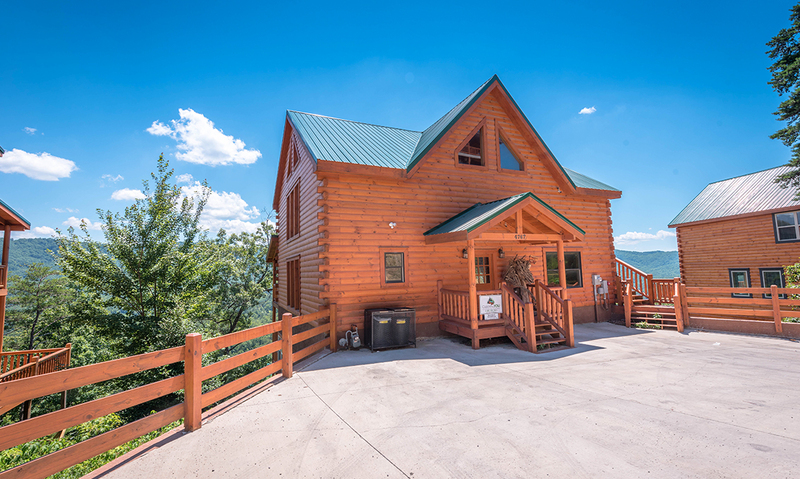 There’s also a coffeemaker, blender, knives, utensils, and plates, which you are welcome to use for your homemade meals with the group. 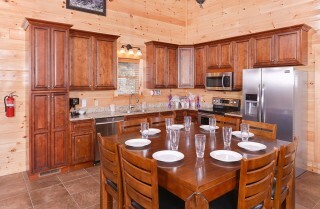 Use the wraparound counter to prepare and display your meals or as a place to store favorite snacks throughout the day. On the nights when you’re not enjoying one of several dinner shows in downtown Pigeon Forge, spend an intimate evening at Beaver’s Treehouse with family and friends around the large wooden table just off from the kitchen. This dining table features place settings for 8 and can function either as a dining space or a display table for buffet-style dinners. 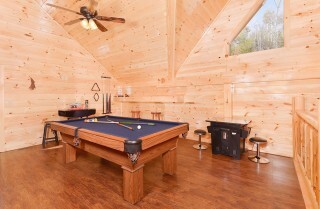 After you eat, you can also use the dining table to play board games with the family or a card game with the guys. The amenities and accessories of Beaver’s Treehouse are there for you—however you want to use them. 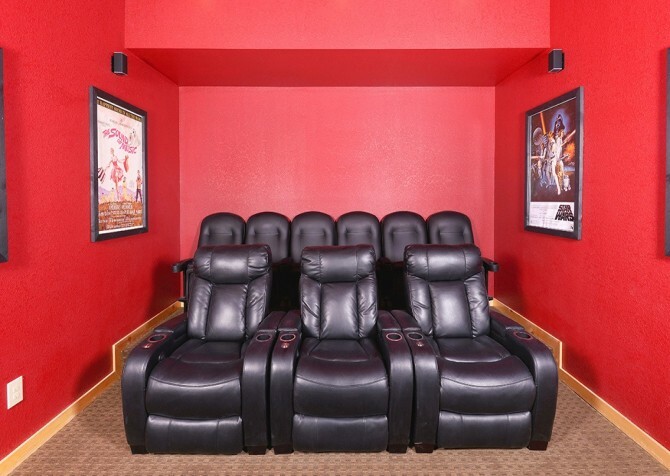 What’s better than going to the movies while you’re on vacation? 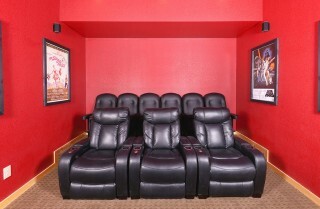 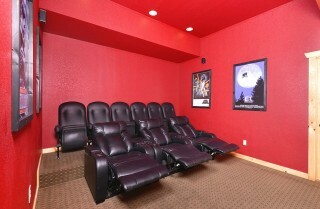 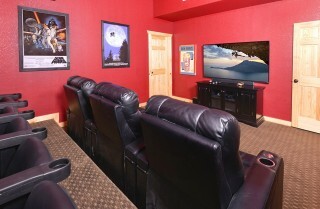 Watching a movie in your own private theater room! Beaver’s Treehouse features a windowless room for your theater-watching experience with a big screen TV, Blu-ray player, movie posters on the wall, and stadium-style seating for 9. 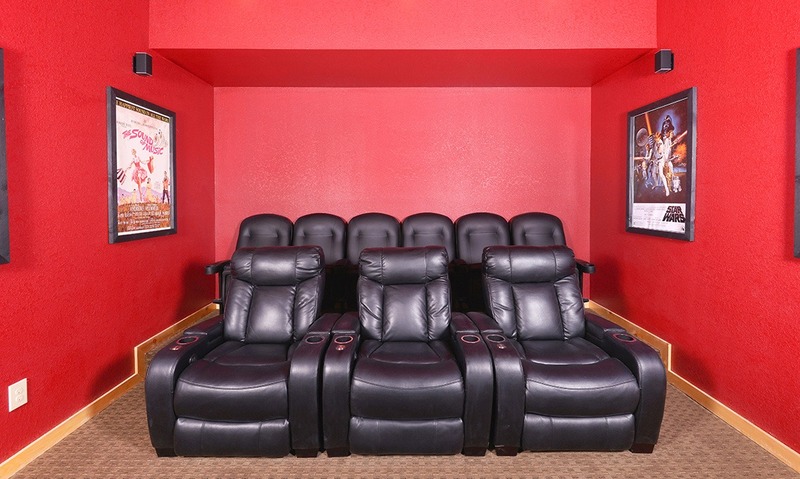 Each theater-like chair in this space features an individual cup holder for convenience, and the 3 chairs on the lowest row allow you to recline so you can watch your favorite movies or new releases in much more comfort than you’ll find at the big screen. 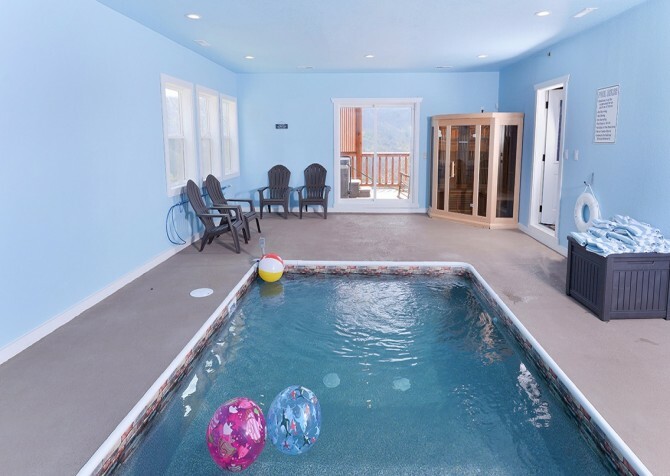 If it wasn’t enough that Beaver’s Treehouse is located inside Sherwood Forest, meaning community pool access in the spring and summer, this cabin also has its own private indoor pool! This beautiful tile pool can be used in all seasons and is the perfect size for your small group. 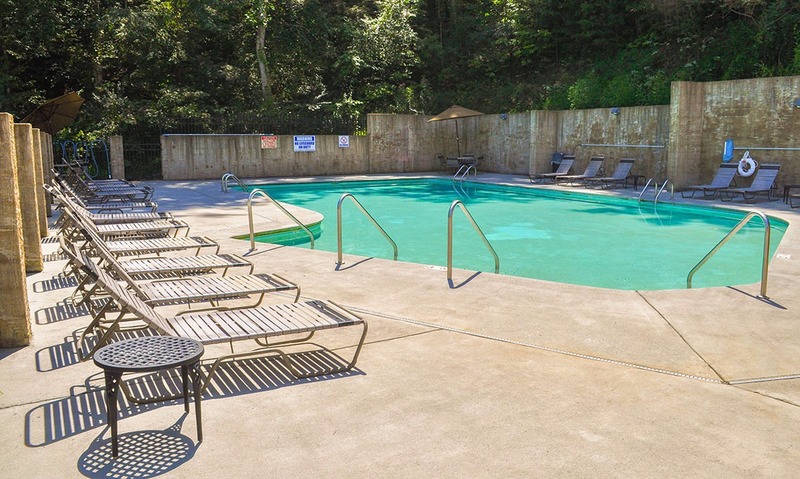 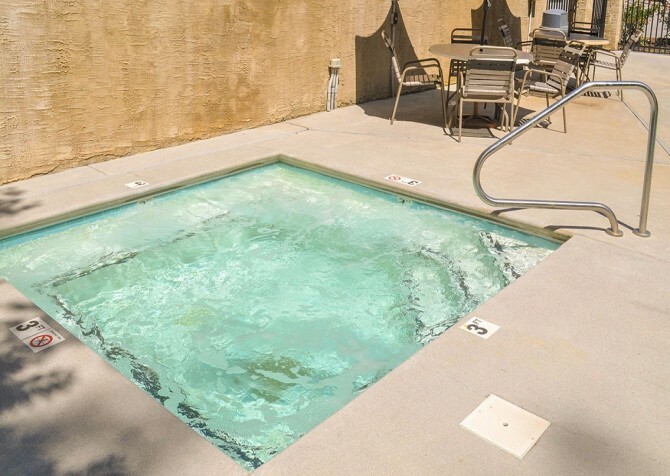 Enjoy a refreshing swim no matter what time of year you visit with views of the Smokies right outside your window, with water kept at 87 degrees and gas heated. 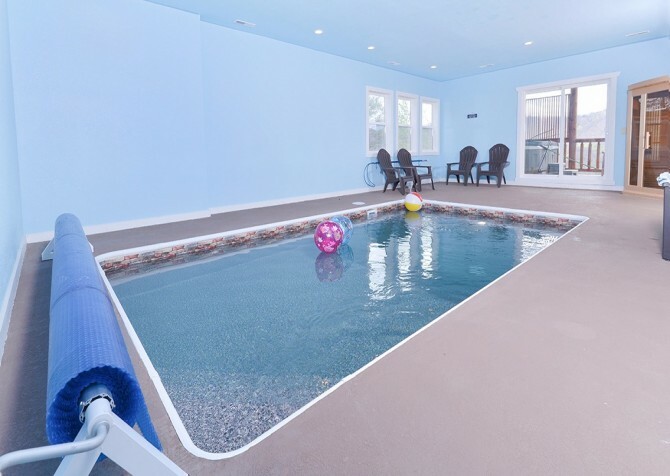 Inside the pool room, you’ll also find patio chairs. 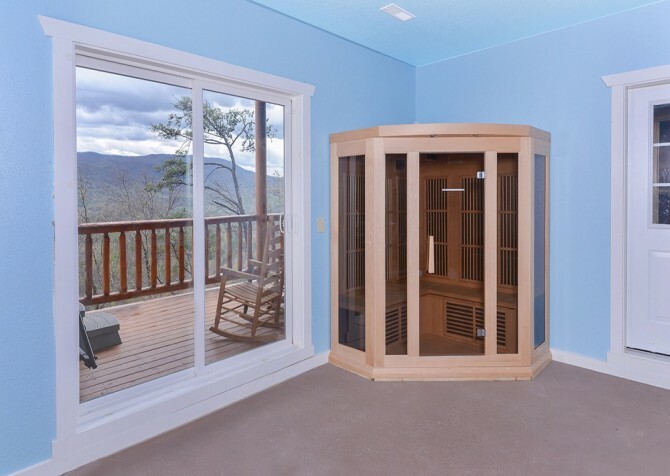 This cabin even features a sauna! 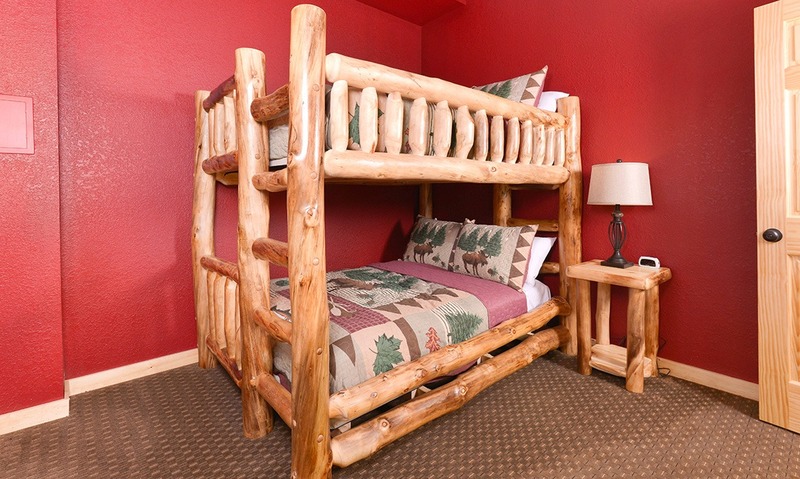 You don’t have to go far to find the perfect way to relax during your stay at Beaver’s Treehouse. Beaver’s Treehouse comes with 4 bedrooms and 4 bathrooms. You’ll have plenty of space for up to 14 people to sleep in this Pigeon Forge cabin with 2 king-size beds, 2 full-over-full bunk beds, and 1 sleeper. Each bedroom features homey additions like end tables, reading lamps, windows, ceiling fans, and its own TV. You’ll sleep comfortably and in Smoky Mountain style when you stay at Beaver’s Treehouse. Although there is plenty to do inside Beaver’s Treehouse, this cabin also features an outdoor deck your group is sure to love. 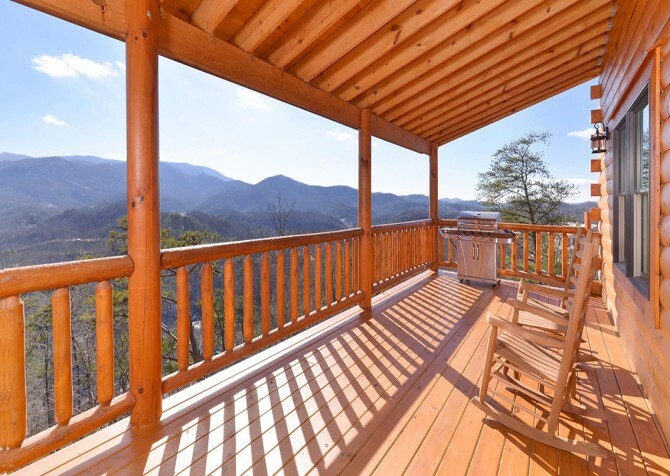 With sweeping views of the Smoky Mountains, this cabin offers rocking chairs, plenty of deck space, and even an outdoor hot tub to enjoy them from. Take advantage of the gas grill during your stay, and you’ll have a great time with family barbecues or a steak dinner to celebrate special occasions. Of course, don’t forget about heading down to the community outdoor pool and hot tub that’s part of Sherwood Forest. 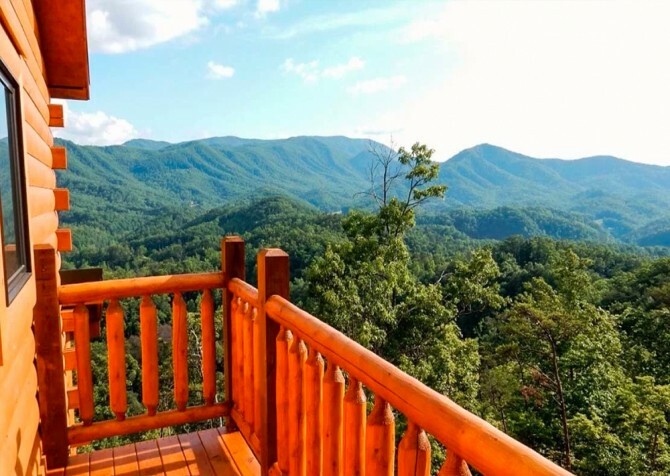 And when you’re ready to enjoy the great outdoors beyond your Pigeon Forge cabin, enjoy natural swimming holes and waterfalls in the Great Smoky Mountains National Park. You’ll have plenty of options for taking in the natural beauty of the Smokies during your stay at Beaver’s Treehouse. This cabin already comes with an impressive list of amenities to make your stay in Pigeon Forge full of fun: an indoor theater room, a private pool, an outdoor hot tub, and more are just a few ways to entertain your group while you’re in the Smokies. 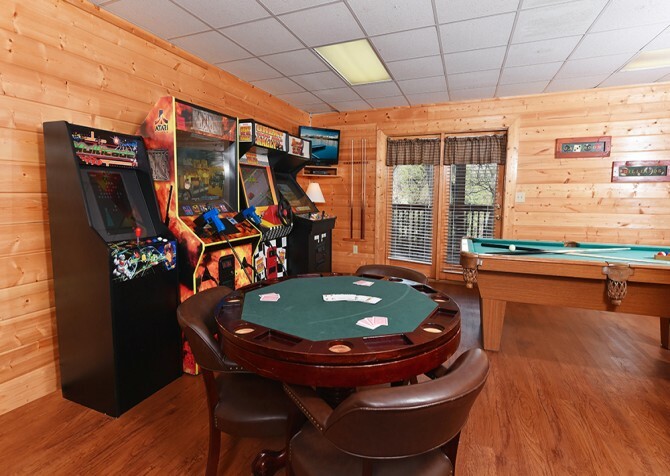 This cabin also has a loft space that features a pool table and arcade machine. 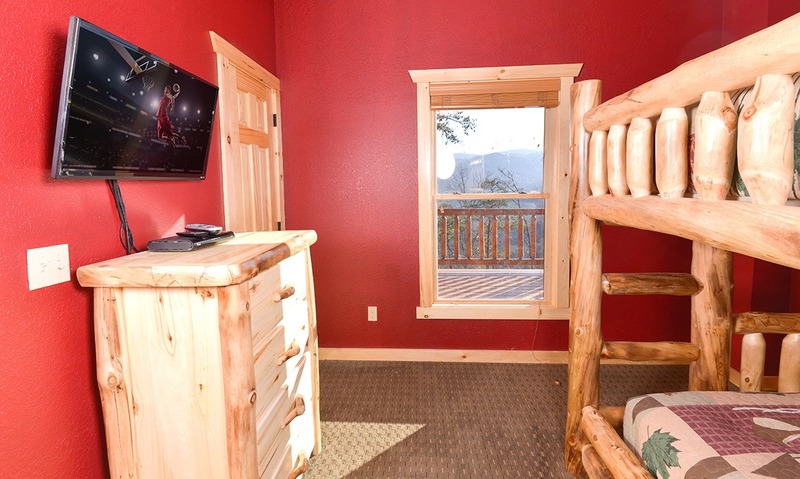 And to add to your convenience while you’re away, be sure to use the washer and dryer available to you at Beaver’s Treehouse. Finally, this cabin offers free Wi-Fi access, giving you the ability to easily research popular Pigeon Forge attractions like the Elvis Presley Museum while you’re away. One of the most popular dinner shows in the area, Dolly Parton's Stampede is a night of good food and fun with horses, a hilarious show, and delicious Southern fare like hickory smoked barbecue. Bring kids or a group of adults for a fun time in Pigeon Forge. For a unique golf challenge in the Smoky Mountains, check out Fantasy Golf. 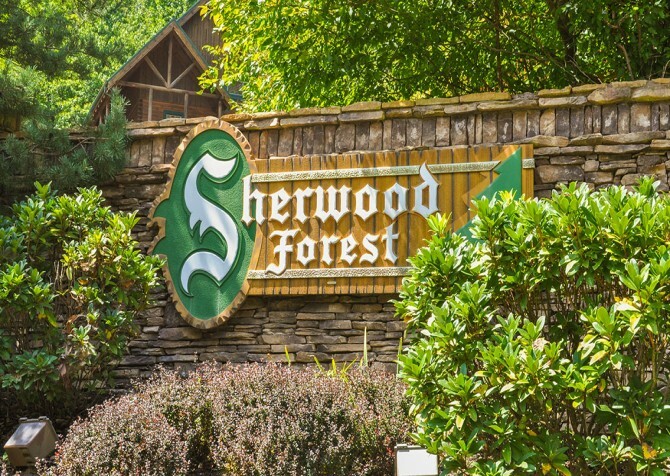 You’ll find fantasy animals, castles, and more on this 18-hole course. This mall is easy to spot in Pigeon Forge because the entire building is under a bright red roof. 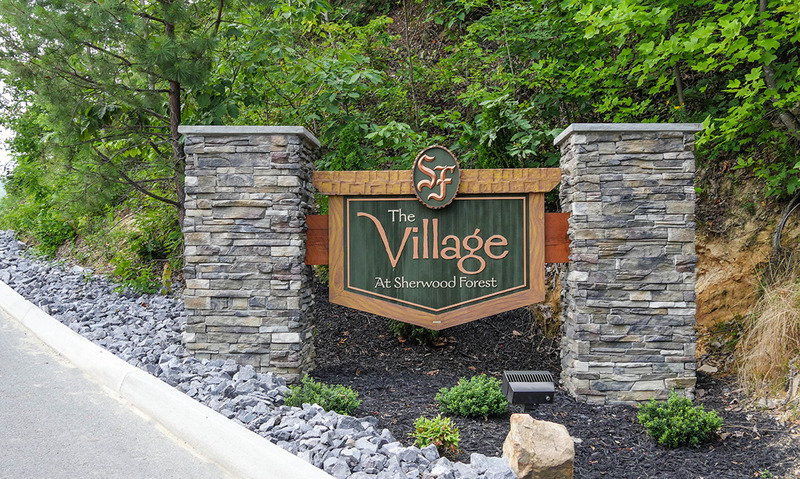 Enjoy name-brand outlets as well as unique shops and, of course, amazing deals! "We stayed at Beaver’s Treehouse in November and it was great! 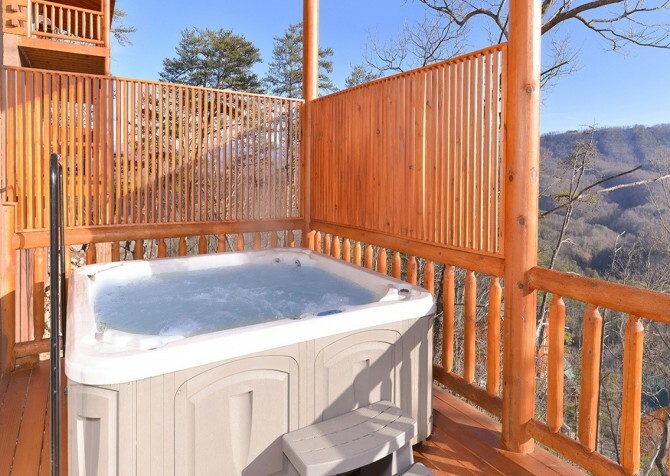 The view out the back of the mountains right as the leaves were changing was incredible. 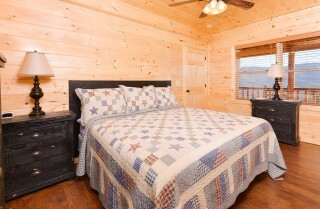 The cabin itself was so spacious, very clean, and had lots of activities for everyone. 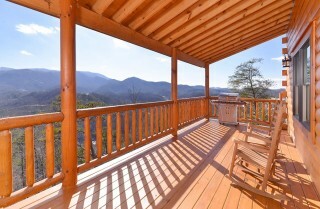 It was also close to the attractions and restaurants of Pigeon Forge which was a plus. 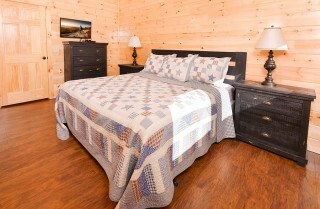 The booking process was easy and it was nice to have a welcome pack with some essentials to get us started for our stay. 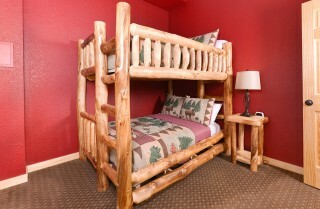 Definitely can’t wait to stay here again and…"
"We stayed at Beaver’s Treehouse in November and it was great! The view out the back of the mountains right as the leaves were changing was incredible. 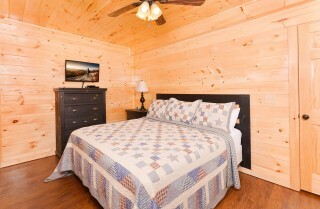 The cabin itself was so spacious, very clean, and had lots of activities for everyone. 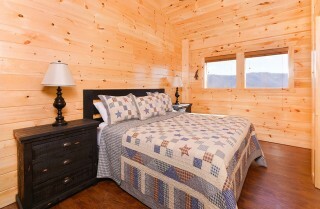 It was also close to the attractions and restaurants of Pigeon Forge which was a plus. 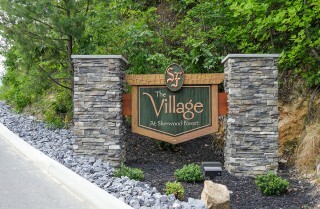 The booking process was easy and it was nice to have a welcome pack with some essentials to get us started for our stay. 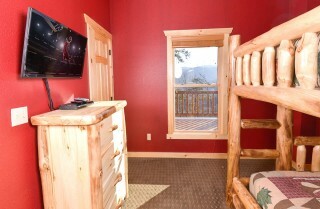 Definitely can’t wait to stay here again and will use this company for all our future bookings in this area!"